Overview of The Pillars, Field of Dreams, and Betty’s Pillar area. 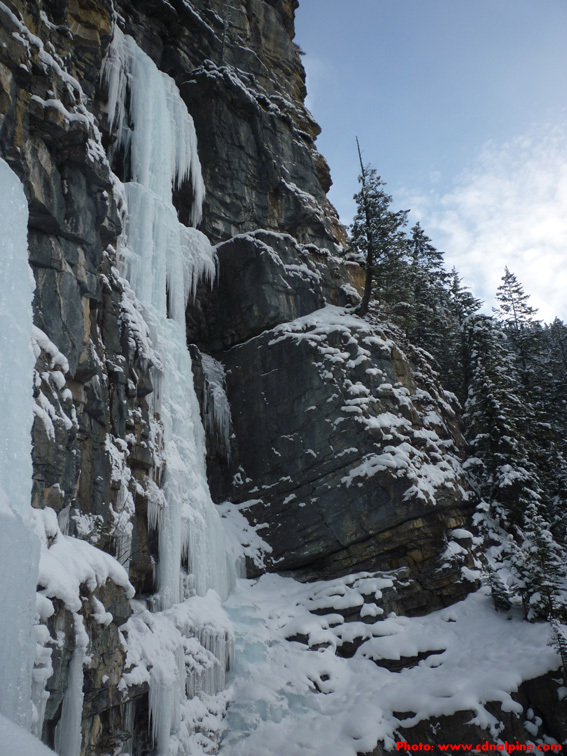 Approach: Park in the lot at the start of the Yoho Valley Road (Takkakaw Falls road) just east of Field. The road is closed in the winter. The Pillars area is visible from the Trans-Canada Highway while descending the steep hill towards Field. Hike or ski up the road until the routes are obvious across the river. Cross the river and bushwack the last bit to the climbs. About 1 hour total. See the overview photo above to locate each climb. Climber at the base of The Pillars, either start here or down to the left for a more sustained climb. 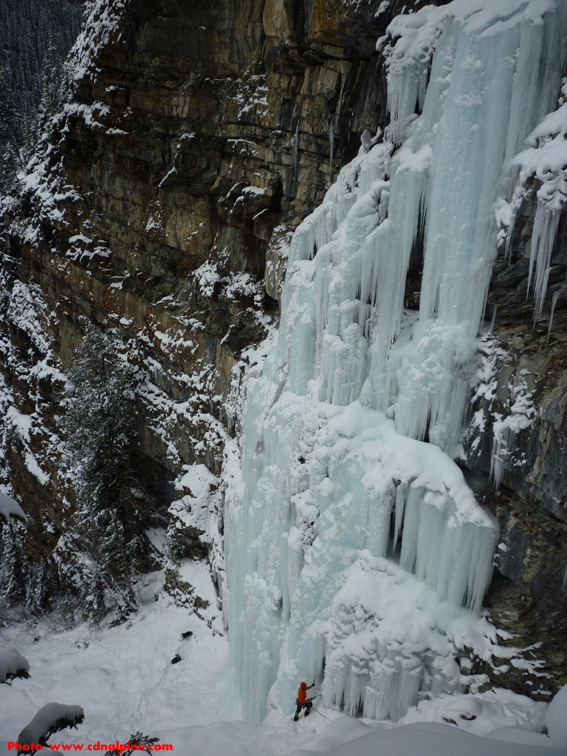 The Pillars (III, WI4, 55m) – the lefthand flow has a variety of options, climb whichever looks best. There is a bolted station about 40m up but it can be hard to reach and isn’t really usefull if you want to climb the last 15m to the top. Harder options exist on this route. The Pillars on the Left, and Field of Dreams on the Right. Field of Dreams (III, WI5, 75m) – the sweet pillar to the right of Field of Dreams. Can be very difficult for the grade at times! Climb a short bit of ice and some snow to a belay below the main pillar. Launch up the pillar to the top, or break it into two pitches with a belay in a cave about 20m from the top. 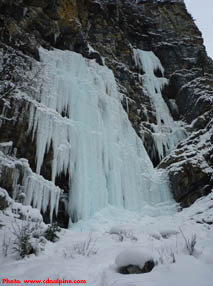 Unknown – there is some fun looking ice in a slot just left of Betty’s Pillar. It has likely been climbed, but details are unknown. Betty’s Pillar (III, WI5, 50m) – start by climbing ice on the left, then traverse into the base of the main pillar. Some years the pillar doesn’t look to confidence inspiring and may be subject to collapse. Other years it is fatter and fun! Gear: Ice screws. 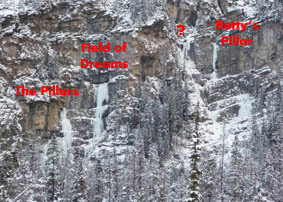 Rock gear may be useful for Betty’s Pillar some seasons. Objective Hazards: There may be some avalanche hazard. Crossing the river to reach the routes can be dangerous at times.